Firstly, I need to make one thing clear. 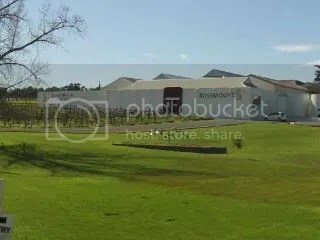 I was a fan of this facility being Seaview Estate – in the late 80’s I visited this cellar door many times and I visited the old Seaview Glenloth Winery a number of times also. When I came back to the Vale (about 2.5 years ago) I was upset that the Seaview Cellars had a name change. I though Penfolds bought Seaview and Rosemount – it felt like it was the other way around. Call me old fashioned but for me this old facility on Caffrey Road will always be Seaview to me. Now I got this off my chest I can talk about the winery and the wines. This cellar looks like it is a facility to store wines as the Ingoldby Road winery now makes the wines. The facility has extensive gardens for the kids to run around in or to have a picnic. Inside there is the old huge vats and a barrel room that looks like it is set up for functions. In this area is quite often an art display. The tasting area has an area for the kids to do some drawings and general seating – where one can be served a cheese platter or some nice brewed coffee. Not all the Rosemount wines are available for tasting as there is a large number of wines. It was good to see some cellar door only wines as there is a limited reason to visit this cellar door to buy wine – discount liquor stores can sell their wines at a discount compared to the cellar door prices. This Adelaide Hills wine is typical for variety with very herbaceous and cut grass aromas that lead into passionfruit and gooseberry flavors. Not really my style but I could see a lot of people liking this wine. This limited distribution wine (cellar door and restaurant sales only) is quite aromatic for an unoaked chardonnay the palate has good acid and all the flavors expected from the variety – melons and peach. I would still rather an oaked Chardonnay. Now we are getting somewhere – the 3 months of oak treatment makes a distance difference to the wine. The wine is currently slightly dominated by the oak and probably needs some more time to integrate with the grapefruit flavors. The finish is long with some good tangy acid. There is some classy french oak treatment here. The aromas have a real lemon peel with an underlying nuttyness – very pleasant. The flavors are well balanced with stone fruit (maybe nectarines) instead of the expected melons and lovely oak right through the palate with a lovely oak finish. This was certainly the best of the white wines with the complexity here would go well with a variety of foods so why not match it with a Chinese or Thai banquet. Here is a late harvest Riesling that is only available at the cellar door (due to the limited quantities made). There was a real citrus aroma with some aged, slightly oxidative characters showing through. The palate was not as sweet as I expected and one can tell there is some good Riesling fruit here and such a good acid finish for a late harvest style. I suspect this wine is the product of of the hot 2008 vintage. Drink very cold and very young. This low alcohol (7.5%) slightly carbonated Moscato has turned into a large volume marketing success for Rosemount. Served on ice (even at the cellar door) is just a refreshing drink that tastes just like grape juice. This is a classic drinking with friends wine – I used to call this a veranda wine, and not really a food style. Served so cold it is difficult to get the full aromas for this wine but the flavors are something else. The 5% Shiraz added to this wine makes such a difference – it creates a typically Shiraz (red grape) notes to the sweet grapey flavors. A Cabernet, Sangiovese, Pinot Noir and Muscat blend that has a relatively high level of sweetness and is served cold. I would suggest this needs to be drunk very cold as this wine just shows over ripe “porty” characters. This is a big pass for me and my palate. Another wine with residual sweetness and is made to be served chilled. The aromas are cherry and red fruits (raspberry) dominate. The flavors show an initial hit of red Grenache fruit that transitions into some Shiraz based black fruits. There is enough tannins here to leave a drying effect even though there is a lot of sugar here. I can see a large number of people liking this wine, but again not for me. This blend of 47% Grenache, 47% Shiraz and 6% Mourvedre is one of my favorite styles. The aromas start with quite strong red fruits with some underlying strength from the Mourvedre and the toast oak. The flavors start with the expected red fruits and then layers of depth come on through. Nuances of cinnamon combine nicely with the oak tannins. The finish was softer than I expected but it was lingering. I keep thinking of a caramelized onion tart with roasted cherry tomatoes. The wine has seen both American and French oak and shows all the aromas typical for McLaren vale Shiraz – mulberries, spice and even some coffee. The flavors continue with mulberries and blackberries but has a slight bitter finish. Seeing this is a 2005 wine the bitterness will probably remain – unfortunately a pass for me again. This wine has been in bottle for about 6 months and my first thoughts were that this wine would be quite young. My suspicions were correct this wine has lots of strength and would do well with a number of years before opening. I was particularly pleased there was none of vegetative characters I quite often find with Coonawarra Cabernet. The aromas were complex with blackcurrent, licorice and nutmeg. The flavors are black fruit dominate with very dry dusty tannins. Too early to tell the best food match but I suspect that some lamb with a good mint sauce may be close. An unusual blend with 83% Cabernet, 9% Merlot and 8% Petit Verdot. I got cassis aromas and some plum from the Merlot. The blackberries and plum continue in the flavor regime with some spice and layers of tannins that give the wine a wonderful length. This wine also needs a number of years before showing it’s best. My next post will have reviews on the dessert wine, port and the Flagship wines. This entry was posted in Mclaren Vale, wine and tagged Cabernet, Cabernet Sauvignon, cellar door, Chardonnay, Grenache, Mclaren Vale, McLaren Vale Wine, Mourvedre, Riesling, Shiraz, wine, wine McLaren Vale. Bookmark the permalink. When we were living in England (the years around 2000), we quite liked Rosemount wines and bought them with some regularity. After leaving England and moving to Australia, we still liked Rosemount wines and bought them, but after a year or two here, we felt that the quality was on a downward spiral (while prices stayed the same or even went up!) and we stopped buying them and have never gone back to doing so. Judging by this testing, you seem to find their wines worthwhile. Has there been a change for the better? Or are these just wines available at the cellar door and the ‘regular’ stuff found widely available is still not really all that good? Thanks for challenging my tasting notes. If you are referring to the standard diamond label that one finds in the bottle shops from Rosemount then I would agree about the quality change. I only tasted 1 of these wines at the cellar door. There were a number of wines that I indicated were not for me. There were a few cellar door only wines – with an emphasis on sweet styles (not for me). The Show Reserve Wines were better but I was disappointed by the Shiraz. The Premium wines in the Part 2 of the tasting were a step up but a major increase in price as well. Overall, there are better options for me around McLaren Vale. I’m sorry. I didn’t mean to sound combative or challenging. I was merely curious about your opinion about the relative quality of a brand (name) wine, the quality of which I, personally, feel has deteriorated over the years. At least: over the years since I first tasted it. bettiwettiwoo – Please do not be concerned – I love it when I get questions and thus challenged about my opinion. A friend of ours visiting overseas is particularly interested in the above series 2008 Vineyard Series Ripe Red. Unfortunately we have enquired at several local Liquorlands, cellar master etc and could not locate it. Any suggestions as to where we may be able to purchase this in the next week or so?